The seculars are not liking it and for obvious reasons. For ages; at least from the days Nehru took charge, all that India achieved in terms of social scaling and cultural fabrics is lot of appeasement for Muslims in expense of everything else. Sometimes even the national sentiment and security.If Sahabanoo is a classic case of bending 90 degrees backward to please few fanatic Mullahs, ‘Muslims have the first rights to all national resources’ jibe of Dr. Manmohan Singh is a shameful incident in a democracy where equality to all is touted to be the founding Mantra. Prolonged appeasement of Muslims also gave birth to louts like UR Ananthmurthy, Girish Karnard, Mahesh Bhatt, Sabana Azmi, Javed Akhtar, Barkha Dutt, Rajdeep Sardesai to further exploit the situation and milk their own benefits. Such state policies also gave opportunities for some outright anti-India activities. Deelip Padgaonkar types even mingled with ISI sponsored Break-India agents and yet never questioned, let alone thrown behind bars. In nutshell, the seculars enjoyed an easy life with lot of free money transferred to their accounts to carry on with their anti-India stance for one sole reason – votebank politics. But things are changing and changing at a rate that is making these secular morons jittery. Since Modi became the primnister, much to the disliking of these secular frauds, things are getting little difficult for these anti-India agents. Modi’s idea of ‘governance to all, appeasement to none’ is taking a toll on the psyche of these easy money accumulating leeches.From an average sold out media prostitute to the likes of infected mouth Manishankar Aiyer, a lot of clowns are getting a pinch on their respective backs. They know they can’t do much except barking here-and-there but seeing their pet project getting dismantled by Modi at the rate of nots must still be a painful affair for these left liberal frauds. The moment Modi became the PM he made one thing very clear – I am here to deliver on the promised lines. I am here for everyone, irrespective of cast, creed and religion, those believe in one India. I am here for everyone, those believe in achieving by hard work than free doles distributed in the form of minority appeasement. Such statements and ideas are poisonous arsenal for liberal thugs since their good old days of merry making is vanishing quicker than one can think. No wonder why loathsome entities like UR Ananthamurthy were ready to leave India in eventuality of Modi becoming the PM. Now all of a sudden, actions are been taken on issues on which the earlier Congress and their deplorable congregation called UPA used to play Ostrich. Such brazen application of the law of the land on their beloved Muslims is shaking these secular morons from inside. Let’s look at this latest Love-Jihad nonsense and how the seculars are fuming like pregnant Cobras. First was the incidence when a Hindu teacher teaching in a Madrasa was abducted and gang raped repeatedly and then forced to change her religion. Well, I give that to the Madrasa since it is a kind of place where pupils are taught to hate humanity, women, every other religion and their own country. So when few members of a Madrasa implemented their own teachings as an act of practical for their students to learn, it never came as a surprise for me.I wasn’t surprised but it still was a heinous act, not only on the dignity of a woman but also her religious beliefs. But how many hours of howling you saw on this topic on primetime TV? How many seculars you heard shedding crocodile tears for the woman? Just imagine the crime perpetrated by few members of a Mat against a hapless Muslim woman. I am sure the entire secular lot would have gone berserk. Arnav Goswami might as well have carried out a 5 long hours of News-Hour debate to dissect every bit and insulted at least half of Hindu population personally. Forget the media; had there been UPA government, I doubt if actions would have been taken against the scoundrels in the name of votebank politics. But not anymore since this NDA government believes in applying Indian laws across the board without any appeasement or prejudice.I am sure; the seculars must be grossly disturbed by the actions taken by the authorities and home ministry in apprehending the thugs, though they never admit their dissatisfaction in public. Such clandestine our appeasing system had become under the watchful eyes of Congress and other secular outfits. Ditto is the case with the second Love Jihad example. A girl was conned to believe that the person she is marrying is one Kohli, only to realize that he is one Hassan from the religion of peace after marriage. That is not all. After the marriage the girl was tortured no ends to convert to Islam. Wow!! How peaceful the religion is, no? I don’t care if the girl is a national level shooter or not. It is about the dignity of a woman and the rogues involved must be punished exemplary. But look at the jokers who attribute every bad as something that is not taught by Islam but find the members of the same religion perpetrating it time-and-again. The religion advocates conning innocent women with falsified information and then torture them to convert so that the rabid idea of Love Jihad could be uphold. What a religion, I must say. But I don’t see the usual left liberal frauds voicing their anger against such treatment to our women. Again imagine the situation with reverse characters. Arnav Goswami would have debated whole through the night with two third of seculars getting admitted to ICU, either after getting a heart attack or getting dehydrated after 48 hours of non-stop crocodile weeping. 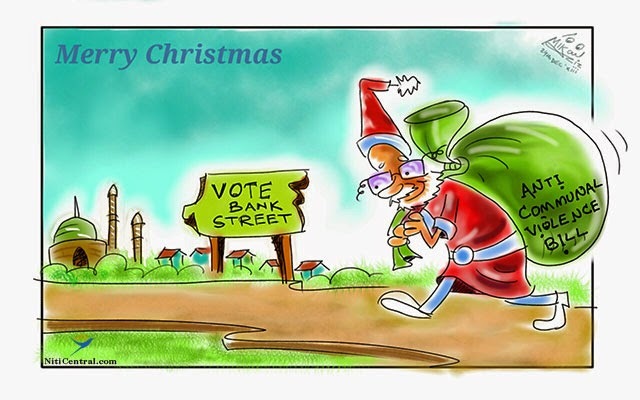 Ditto like the first case, the UPA government would have looked the other way to safeguard their votebank. But not anymore. The home ministry has taken up the issue sou motto and directed to state government to apprise them of the developments every 8 hours. Again, I am sure the seculars would be fuming at the onset of such brazen application of Indian laws on their beloved Muslims. Be it Azad Maidan or Saharanpur or Guwahati, during secular UPA’s time the patrons from the religion of peace were always given free hand to carryout mayhem on the streets and yet no actions were taken. But not anymore. This sudden change of policy by Modi government must have come as a jolt for these peace loving and knife carrying innocents. No wonder their fathers in the pseudo secular brigade are worried seeing such uniform implementation of India laws across all communities. I mean, how could this bigot Modi can even think of not treating the peace loving Muslims above the India laws; just how could, must be the thoughts on every secular’s mind now. Now look at the reactions of these secular morons after India cancelled bilateral discussions with Pakistan. Didn’t I say in the beginning that for these seculars minority appeasement even supersedes national pride and national security? The envoy of Pakistan will blatantly break every protocol and talk to traitors of India going by the name ‘The Huriyat’ and other separatist of Kashmir and yet we being pseudo seculars would not only tolerate this but also would hail the traitors of India as the best thing happening to our country. Not only that, we also would send other traitors like Deelip Padgaonkar to cajole the separatist so that Muslim votebanks elsewhere could be protected. For these frauds, Modi keeping national interest above Muslims is a gross act of communal intent. How dare Modi could think of the nation there by ignoring the evil intent of Huriyats and other scoundrels from that community? Just how dare he?No wonder again that the seculars led by Congress are enraged with Modi’s such nationalistic decision. Moron-E-Hind Manishankar Aiyer even wrote an entire blog citing how Modi’s non-appeasing policies are danger to the nation. Really, I wonder if our mental asylums are running short of beds to allow such rabid mongrels like Mani Aiyer to roam around barking. Everyone knows that we have got nothing to gain from Pakistan except few tons of onions and a handful of third grade singers and half naked girls from there to do item numbers on our movies. But ask the seculars, they would tell you how our very existence is because of Pakistan and the Muslims of India. Ohh yes, morons like Azam Khan told us how it is only Muslims that fought in Kargiland won it for us. Capt. Vikram Batra or Saurav Kalia were factious characters created by RSS and BJP.It’s an irony that our secular frauds readily agree to lick Pakistan posteriors and shame the nation so that their votebank remains protected. Now I am ashamed on myself that we were voting these traitors all this while. Hope the strong stance of Modi government on national pride and national security will continue to further up. May Modi’s idea of ‘Governance to all, Appeasement to none’ will flourish like never before. May these secular jerks eat crow time-and-again for their filthy idea of India and social fabrics. Amen!! It is not Modi becoming PM has hurt his opponents but the level of Victory People Gave to Modi is hurting them. I liked one statement today, "Take one small measure daily.... as a reform... guided with implementation & review, at the end of the year, you will have 365 reforms producing goods to the nation "
Modi & RSS should rule india hereafter otherwise it will become very hard for a hindu to live peacefully in his own country. We hindus have no other country to go to, so it is our duty to elect such a govt. which takes care of hindus first. As far as english news channels are concerned they are all favoring muslims & do not highlight matters such as Tara sechdeo`s case. her so called husband should be hanged in public so that such instances do not occur in future. Last week NDTV journalist srinavasan jain carried out a survey in UP & showed that there are no instances of love jehad in UP, while Zee news programme showed many cases of love jehad in UP. Such journalist shall be put behind bars for misleading peoples.